Today I would like to introduce you to my dear Amiga 1200. Please say hello! This computer has been with me since the year 2000. I purchased it after one of my older Amiga 1200’s died. The old one was a Commodore model, but this one is from Escom. I got it brand new from old stock. I’ve taken extremely good care of it, so it looks almost new today, 11 years later. I look after it often, wiping it clean of dust and checking that everything is in order. The computer is running Workbench 3.1 with several extras added. Believe it or not, but the OS is only using 16 colours on the screenshot above. Thanks to Magic Copper, it looks like a whole lot more! The hard drive is filled with various games, demos, utilities and music modules. I’d like to point out that I use the amazing WHD-Load for my games. If you are interested in running all kinds of games directly from your hard drive, this utility is a must! Please head over to their site to check it out. You won’t regret it. 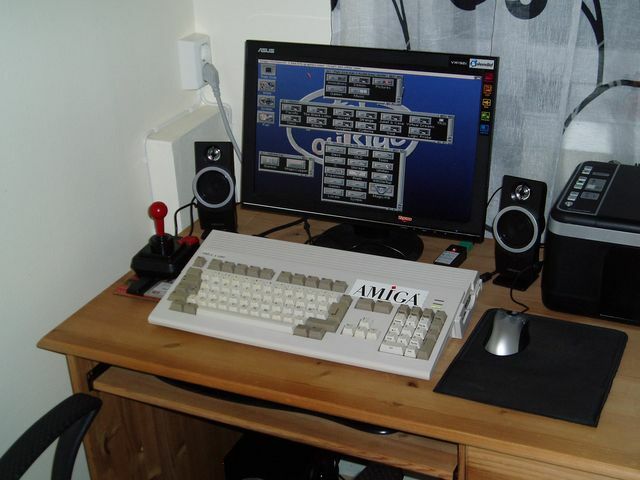 So, what do you think about my Amiga 1200 setup guys? Hello Amiga 1200. 🙂 Did the ones from Escom not have a problem with the floppy drive? Yes, some models from Escom had problems with the floppy drive. I remember some old games refused to work. Not good. If I remember correctly these drives were orginally high-density but re-arranged to become double-density. 🙂 Indeed. They changed them to double-density. Your Amiga 1200 has that good, congratulations. And such were the Apollo? I had a 40MHz 68030 Cobra with a SCSI port that also was good, but if I remember, the best expansion to 68030 was the Blizzard, I think we arrived at 50Mhz and noticed the difference. Would love to try one of those 68060 turbo-cards, but they are unfortunately very expensive. Do you still use the Amiga by the way? Yes, I met people who had the Blizzard and comparing it with my Cobra, there was only difference in Breathless and AB3D2 (wanting to cover more screen) but it was obvious what it implied. I remember how many friends did not understand that with so little memory, speed and configuration could be done so many things at the same time, like the demos, OctaMED, games and its soundtrack (i love Shadow of the Beast, Blood Money and Alien Breed). For nostalgia I survive watching demos, play in WinUAE and listening all the music (including the new mixes in internet). Yes, the multi tasking capabilities was impressive. You could do so much at once! Poor PC users still used DOS or struggled with Windows 95! Hehe.. Cool that you are interested in demos. I like watching them myself. Favourite groups includes Freezers, Anadune, Floppy, IRIS and many more. 😉 Do you have any favourites? Haha, I remember as a PC was very limited, even with the Creative cards, and still was far away. Even worse, when it appeared the emulator PC-Task. It was rather interesting to know that people who had devoted his time to programming, to make music, demos, etc … many are practically works of art. My favorite band is The Black Lotus, I still remember when I buy the CD Aminet (7 I think) and came a demo of them was called Dark Side, just impressed. The other thing I also like is the music, the MODs (octamer rulez!) and the soundtrack of the games … music from Shadow Of The Beast, Blood Money, R-Type, Capital Punishment is impressive. The Black Lotus have released a ton of good demos. 🙂 I agree that Darkside is a nice one, along with Tint and Captured Dreams. I just had an Amiga 500 before but now I use UAE. I have used DPaint IV, Protracker, Filemaster, and XCopy as I remember.. and a lot of smaller stuffs. I have many of favorite games on Amiga, so I only mentioned the 1st two games I tried on the A500 and it was love at first sight: Lotus Turbo Challenge II and Turrican 2. Then it came so many super games! Many thanks for commenting. 🙂 Cool that you used to own an Amiga 500. It was a great machine for its time. The games you mentioned are great. 🙂 Lotus 2 had some very impressive graphics, and let’s not forget the music! So many cool tunes in that game! Turrican 2 is epic. Which other games did you use to play? You mention so many good games there.. 🙂 I’ve played most of them and they rock. 😀 Can’t go wrong with the likes of Superfrog, Cannon Fodder and Chaos Engine! Cool that you’ve made music in Protracker and pictures in Deluxe Paint. Were you involved in the demo scene by any chance? What kind of PC did you get back then? Does the name 4mat design has anything to do with the musician (4-Mat) by any chance? Did any of you do any mailtrading/swapping back then? That is an activity I miss today. The Internet is great for communication, but there is something special about receiving a few floppies in the post with a personal, physical letter to boot. I remember those 486 PC’s. Plenty of good games for those machines. I too remember the FPS titles and must admit I was a bit envious of those who could play Doom. 😉 Ahhh.. Fasttracker.. that was a good tracker. Hi! Sorry about the long delay! True, long ago, when someone came to me with a few floppy, it was very exciting. We was happy with floppies, and today dvd’s don’t cause as much fun. (or just rarely) Well, a emulator is totally not the same feeling like a real hardware. I hope once I will buy again a Amiga. I watch the ads! A day I read an article about fixing the old computers darkened or yellowish color. This gave me back the hope.